March into Spring with Our New Patient Special! While the prevention and treatment of tooth decay has improved dramatically over the last half century, it continues to be a major health issue, especially for children. One in four children 5 and younger will develop some form of the disease. Although tooth decay in children stems from the same causes as in adults — the presence of decay-causing bacteria in plaque, unprotected teeth and the right mix of carbohydrates like sugar left in the mouth — the means by which it occurs may be different. We even define tooth decay differently in children as Early Childhood Caries (ECC), “caries” the dental profession’s term for tooth decay. ECC highlights a number of cause factors specific to young children, such as: continuous use of a bottle or “sippy cup” filled with juice or other sweetened beverages; at-will breast-feeding throughout the night; use of a sweetened pacifier; or regular use of sugar-based oral medicine to treat chronic illness. If you noticed sugar as a common denominator in these factors, you’re right. As a primary food source for bacteria, refined sugar is a major trigger for the disease especially if it constantly resides in the mouth from constant snacking or sipping. In fact, it’s the primary driver for a particular pattern of decay known as Baby Bottle Tooth Decay (BBTD). This pattern is specifically linked to sleep-time bottles filled with juice, milk, formula or other sweetened beverages, given to an infant or toddler to help soothe them through the night or during naps. All these factors cause a cycle of decay. 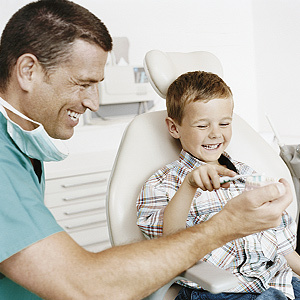 To interrupt that cycle, there are some things you as a parent should do: perform daily hygiene with your child to reduce decay-causing bacteria; reduce the amount and frequency of carbohydrates in the diet, particularly sugar; and protect the teeth by having us apply fluoride or sealants directly to the teeth. Early tooth decay could affect your child's oral health for years to come. With a little care and vigilance, you improve your chances of avoiding that encounter.